Organizations and their IT teams are not in sync when pursuing their digital transformation strategies, according to a new report released today by The Economist Intelligence Unit (EIU). The report, From gatekeeper to enabler: the role of IT when digital transformation is the norm, sponsored by BMC Software, shows a prime example of this disconnect. Two-thirds of private and public-sector organizations in the survey (66%) say they buy new systems and solutions without involving IT teams — a situation that flies in the face of IT's traditional role as a gatekeeper of new technologies. The findings are based on a survey of senior executives and administrators in Asia-Pacific, Europe, Latin America and North America. ■ time pressures, as demonstrated by the finding that 37% of respondents cite excessive length of the procurement process for the failure to consult IT teams on the purchase of new technologies. This apparent lack of collaboration appears counterintuitive, given the generally positive view of respondents towards the benefits of co-ordination between IT and non-IT teams. 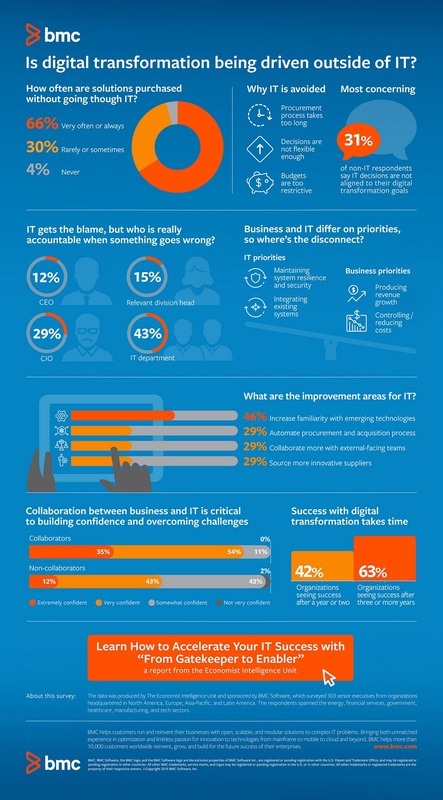 Notably, organizations in which IT and non-IT teams collaborate regularly are significantly more confident about overcoming digital transformation challenges. 89 percent of collaborators say they are confident about overcoming obstacles compared with 55% of non-collaborators. Another hindrance to seeing the results of digital transformation can be time itself. For organizations who have only had their initiatives in place for one or two years, only 42% strongly agree their organization is realizing the benefits of digital transformation. This is much lower than the 63% of respondents who have had their initiatives in place for three or more years. Kevin Plumberg, editor of the report, says: "Digital transformation is not a one-off, unique journey that some organizations are experimenting with. It has become the norm, and companies where IT teams are working closely with the business rather than in silos are better positioned to manage the challenges that inevitably arise."